Although there was no calendar in 2010 due to lack of new material, very early that year I began working on the calendar for the following year. 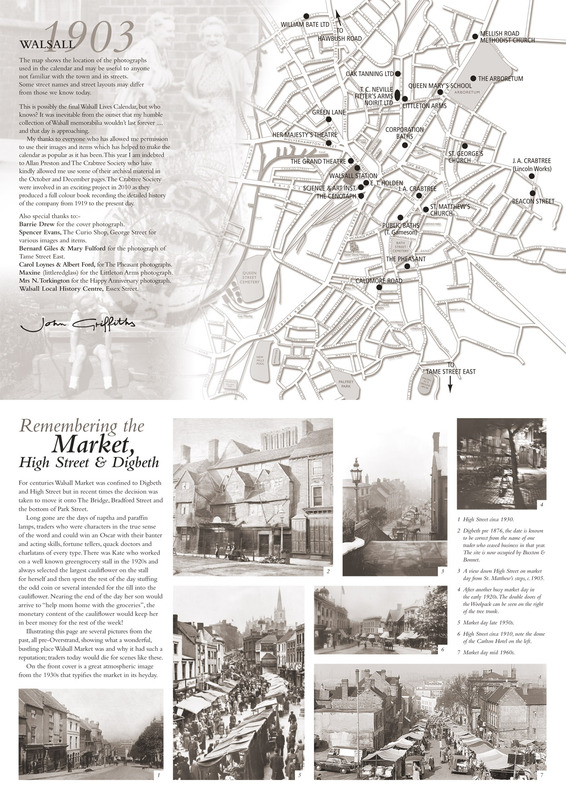 The reason for this was down to a friend of a friend who had a wonderful picture of the market from the 1930s and allowed me to use it on the front cover. The reader may disagree, but in my opinion this is one of those photographs that speaks a thousand words, one can almost smell and hear the atmosphere. In particular I like the dog snuffling around the boxes in the bottom right……and just look at the people…….hundreds of them! The market of today bears little, if any, resemblance to the picture below and it is understandable why so many people mourn its demise. The winter of 2009/10 was reputed to be the coldest for over thirty years but for anyone who grew up in the ‘60s and earlier it would be considered the norm. The winter that remains in many people’s minds as the most severe in recent times is that of 1962/63. Heavy snow and freezing temperatures covered the UK from early December 1962 through to the following March with little respite. 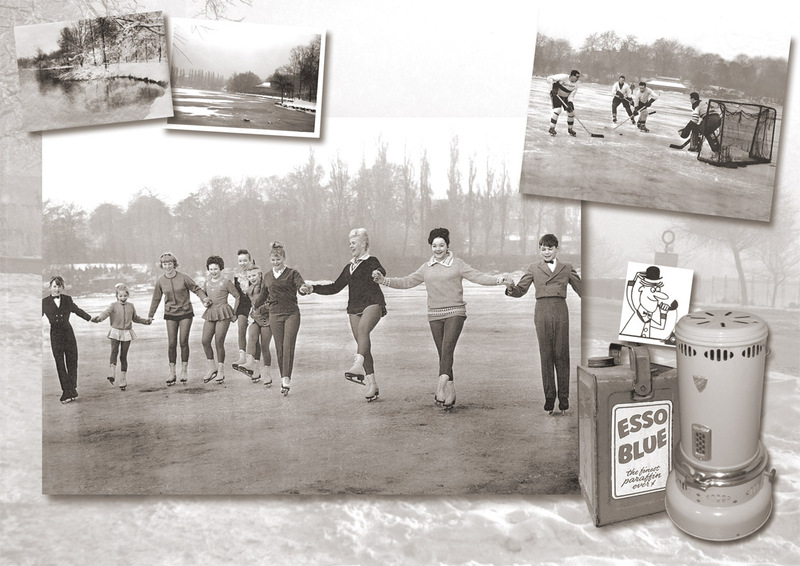 In early January 1963 the Arboretum Lake froze to a depth of 6 inches (15cm) and ice skating was allowed for the first time in over twenty years. On Friday 11th January the lake was open for three days for the people of Walsall to try their skills on skates. Over 3,000 paid for the privilege! Although the Arboretum closed at its normal time, evening skaters were also catered for as floodlights had been installed on the lakeside. In late January an ice show was scheduled on the lake featuring two ice hockey teams and a group of figure skaters from Birmingham who are shown in the main picture above. The skaters group contained two ex-world champions from the 1950s and a budding future star. The boy on the extreme left of the picture dressed in black is John Curry who won a gold medal in the men’s figure skating in the 1976 Winter Olympics. Once again the unpredictability of the great British weather put a damper on the proceedings when it went slightly milder and the ice became wet and slushy. The show did go ahead but the skaters were unable to perform their full act due to the unstable conditions. Shown above the main picture are two smaller ones of the lake taken from similar viewpoints, the one on the left was taken in 1911 and the other in 1963. After a freezing night in the Arbo’ it was home, not to central heating in those days but a roaring coal fire, and, a smelly paraffin heater in the bedroom. The heater shown is a Valor Blue Flame model along with a gallon can of Esso Blue Paraffin to see it through the night ….and who can remember Joe, the Esso Blee Dooler? The main picture above shows the now demolished St. George’s Church around 1900 taken from an unusual viewpoint, looking down Walhouse Road to its junction with Persehouse Street. The more usual view of the church can be seen in the postcard from the 1950s in the top right corner. St. George’s was built between 1873-75 at a cost of £8,000. It was intended to add a tower and spire but these plans never came to fruition. Built to house eight hundred worshippers, by the early 1950s the congregation consisted of about one hundred, ten years later it had dwindled to around fifteen. By 1964 with the building in a poor state of repair and declared unsafe the decision was taken to close it. It was demolished in late 1964 and houses now stand on the site. The leaflet shown at the bottom of the page is for an appeal for the new mission church of St. Martin which was to be built on the corner of Sutton Road and Daffodil Road. After an obviously successful appeal the new church was opened in the early 1960s. 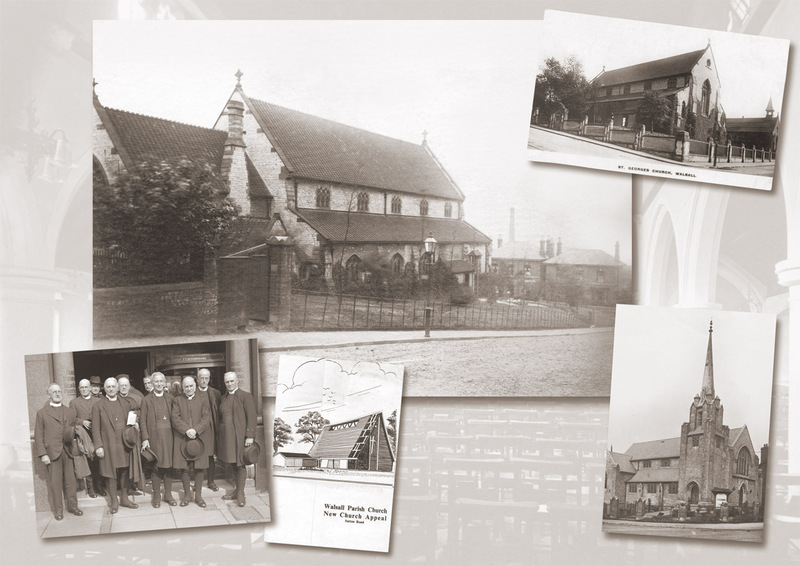 The picture in the bottom right of the main page shows Mellish Road Methodist Church in its heyday. Building of this church began in 1908 and it opened in May 1910. For many years this once attractive church dominated the entrance to Walsall from Lichfield and Aldridge areas but now stands a shadow of its former self. Large cracks and holes in the masonry can be seen from all angles, a legacy from the limestone mining that took place in the area. At the top of this page is a picture of the interior of the church in its former glory. The final picture on the page shows the senior clergymen that attended the Diocesan Conference at the Co-operative Buildings, Upper Bridge Street in early October 1929. The Bishop of Lichfield, Dr. J. A. Kempthorne, is standing in the middle of the front row group along with the Bishop of Stafford and the Archdeacons of Stoke, Stafford and Salop. 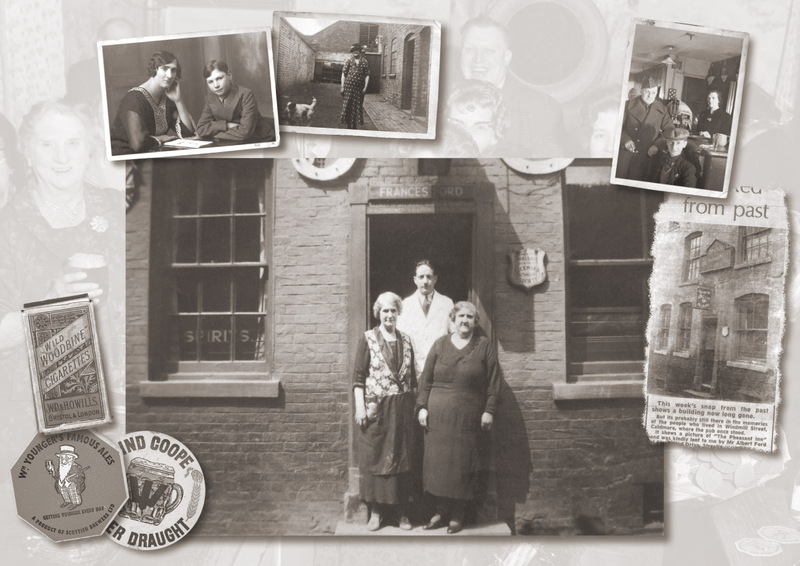 This month’s page focuses on The Pheasant Inn that used to stand in Windmill Street, Caldmore. Originally owned by the Lichfield Brewery Co. but after a takeover it became an Ind Coope & Allsopp house, by 1960 and up to its closure it came under the Ansells banner. Its reputation for serving the coldest beer in Walsall was enhanced by one of the regulars who joked “in winter a pint come with an ice pick!”. The Pheasant’s first licensee was Sarah Stokes in 1851, by 1861 Joseph Beebee was in charge. Throughout its long history it had seventeen licensees but none stayed longer than Frances “Florrie” Ford notching up thirty-nine years from October 1927 to May 1966. It is believed that Mrs Ford was the first woman in the Walsall area to be granted a full licence. During her tenancy at The Pheasant she also became President of the Walsall Licensed Lady Victuallers Society. The decorations that can just be seen at the top of the main picture suggest that the photograph was taken around the time of the Coronation in 1937. Standing on the doorstep, from left to right is Blanche Clubley, Jack Breeze and his mother Mrs Breeze, “Florrie’s” sister. The smaller picture top left shows a much younger Mrs Ford with her son Albert, his mother died in 1977 but he is still going strong at the age of ninety-four. The other smaller picture shows the backyard and the side of the building complete with Mrs Ford’s mother and the family dog. In the top right is a picture of the bar with “Florrie,” regular “Foggy” Wilson and an unknown serviceman; note the gas mantle still in the ceiling. Below that is a well-worn newspaper cutting and is one of the few pictures that shows the full frontage of the pub. The fine picture that takes centre stage for this month is from around 1930 and shows the male staff of the Oak Tanning Company, Hatherton Street congregating outside the factory awaiting departure for their annual trip or “breakfast run”. Of the fifty-five men pictured in front of their “charas” everyone of them is wearing a hat of some sort, except one, the young man fourth from the left. There’s always one! 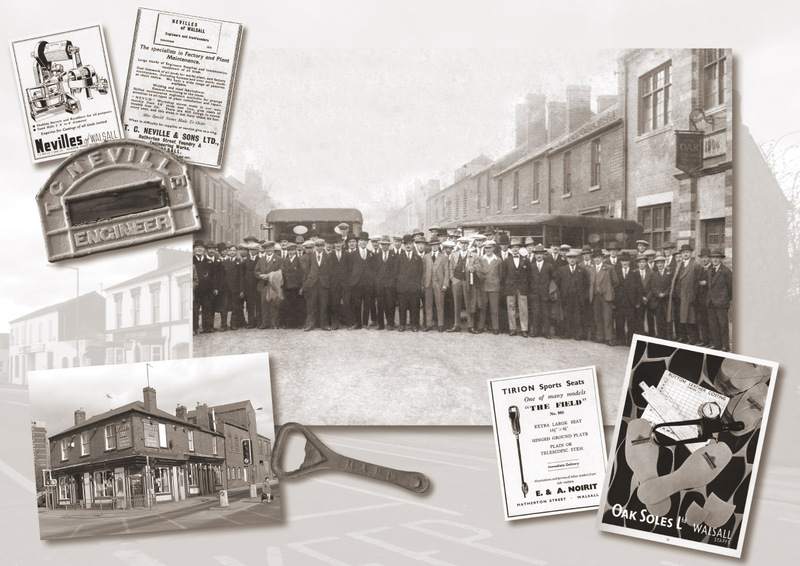 The factory opened in 1908 and ran for many years, one outlet for their business was supplying leather soles for the shoe trade, then thriving in Northampton. The picture in the background, shown in its entirety at the top of this column, shows a rather sad-looking Hatherton Street in March 2009 with the derelict buildings awaiting demolition. In between the premises of Noirit (at the far end) and Nevilles stood the Fitter’s Arms which pulled its last pint around April 2008 after at least one hundred and forty-seven years of trading. Another more famous pub and of a similar age was the Littleton Arms which stood on the corner of Littleton and Hatherton Streets and is shown in the bottom left of the page. The photograph dates from 2005 and shows the thriving premises just prior to its closure and eventual demolition which was necessary to make way for the new ring road. A vigorously fought campaign by the proprietors and regulars couldn’t save the premises from its fate. At the edge of the picture the flats in Teddesley Street can just be seen, they too have also now been demolished. Top left is the letterbox cover and two advertisements for T. C. Neville & Sons Limited, engineers and castings manufacturers who were immediate neighbours of the Fitters. The advertisement for E. & A. Noirit shows one of their products, the shooting seat, they probably didn’t sell too many of those in Walsall! What a great picture it is that takes precedence for this month, showing the top end of Park Street around 1910.The composition cannot be faulted because it shows three of Walsall’s old landmarks. In the foreground is the station that was opened in 1849 and after a devastating fire in 1916 was rebuilt and opened in 1923. Also included in the picture are Walsall’s two most famous theatres, The Grand and Her Majesty’s. At the top right of the picture is a programme from each theatre both dated 1926….. and “tuppence” for the two. In the top left corner is a double page spread from Her Majesty’s Theatre programme showing the evening’s entertainment, “Oceans of Notions” which was shown twice nightly. 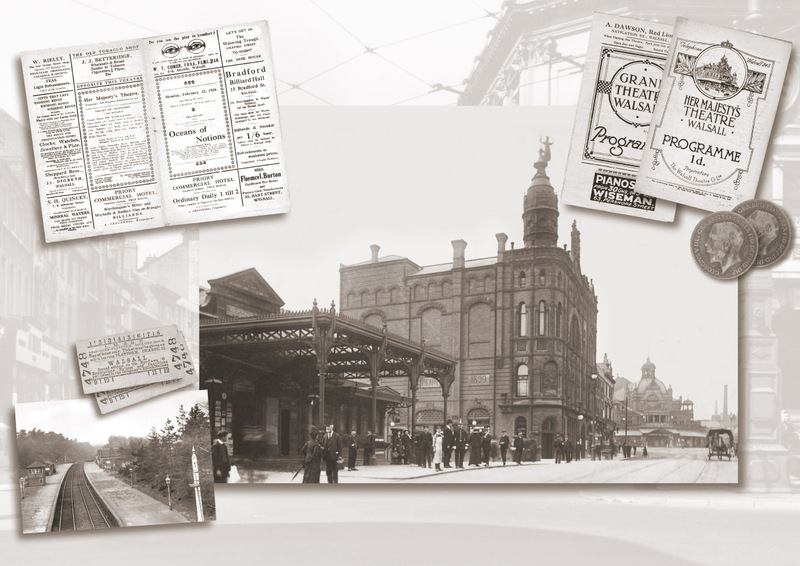 The Grand Theatre which stood on the corner of Park Street and Station Street was first called the Alexandra Concert Hall in 1873, six-years later it was known as the Alexandra Theatre then the Gaiety, finally opening as The Grand after a rebuild in 1890. By 1931 it had been converted to a cinema and eventually burnt down in 1939. Her Majesty’s opened in 1900 and became a variety theatre in 1905. Two years after The Grand became a cinema Her Majesty’s followed. The building shown in the picture was demolished in 1937 and a year later it was rebuilt and opened as The Savoy cinema. The cinema was demolished in the mid 1990s and Woolworths took over the site in a new building that was influenced by the architecture of the original theatre. The site is now occupied by T. J. Hughes. The smaller picture in the bottom left is of Streetly Station, the gateway to Sutton Park and a favourite venue for a day out for Walsall people and only a short train ride away. If you couldn’t afford that, there’s a couple of platform tickets and you can watch the trains go by. The main picture above shows the inhabitants of Hawbush Road, Leamore gathering round for a group photograph before their street party began. This particular celebration was to mark the Coronation of Queen Elizabeth II on Tuesday 2nd June 1953. The day itself turned out to be quite cool and very wet, but bad weather or not, the happy group probably still had a great day after the grim years of World War II and with rationing still in place. The booklet in the bottom right on the page above shows the official brochure issued by the Council to honour the occasion. 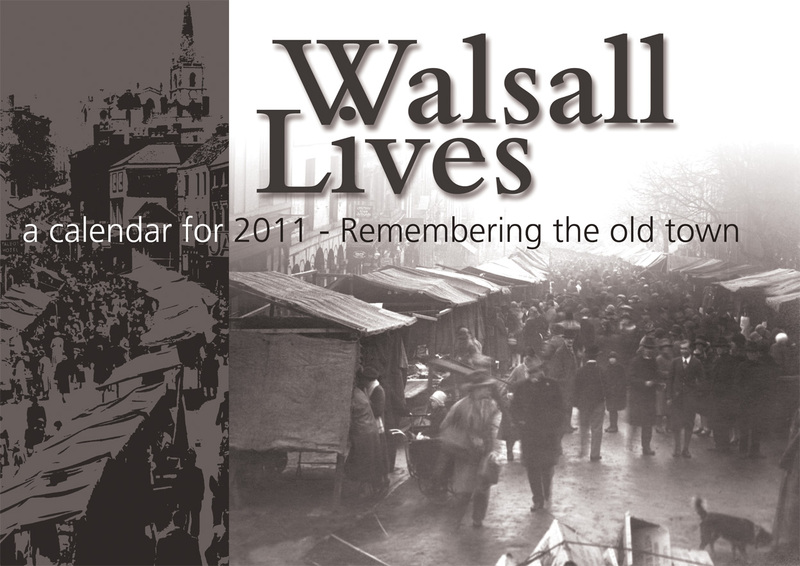 Walsall, like everywhere else in Britain, had its own itinerary of events that included concerts, parades, military displays, motor rallies and sports meetings which began on 20th May and continued until 14th June. On the day itself a concert by the band of the South Staffordshire Regiment was held in the Arboretum and in the evening, at the same venue, open-air dancing took place with music from Clive James and his Orchestra, followed by a firework display at 11.00pm. At the Town Hall a Coronation Ball was held in the evening with dancing to Hedley Ward and his band. 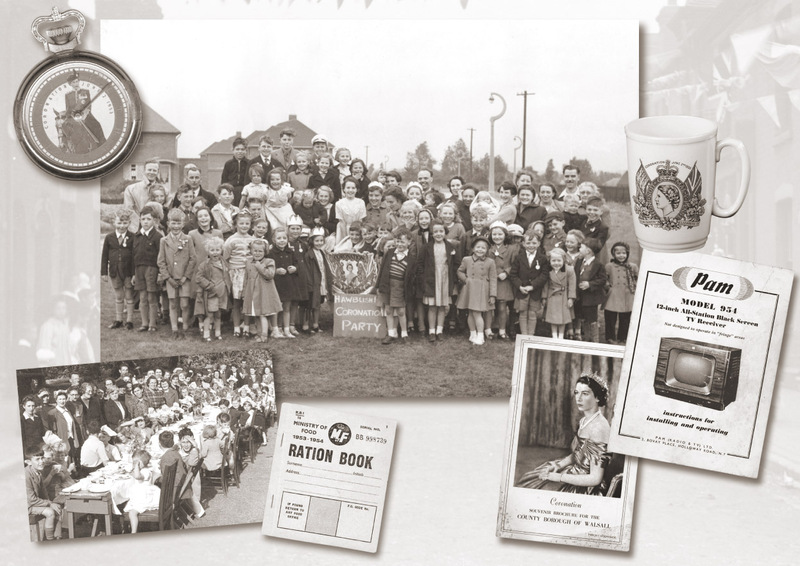 20,000 schoolchildren throughout the borough received a china mug as a souvenir, which can be seen in the top right. Televisions were becoming popular and especially for events like the Coronation. Although the instruction manual for the PAM tele’ is for a 1957 model the size would have been the same in 1953………a twelve inch! The picture in the bottom left shows another street party from around May 1945 with the residents of Tame Street East celebrating VE Day. The main picture this month features the Army Cadets from Queen Mary’s Grammar School at Hagley Park Camp, Rugeley circa 1913. How many of these young boy’s names would be listed on the school’s Roll of Honour, shown top right, some six years later? Only one member of the Corps can be identified in this picture and that is Captain F. L. Overend who is seated in the centre of the middle row. 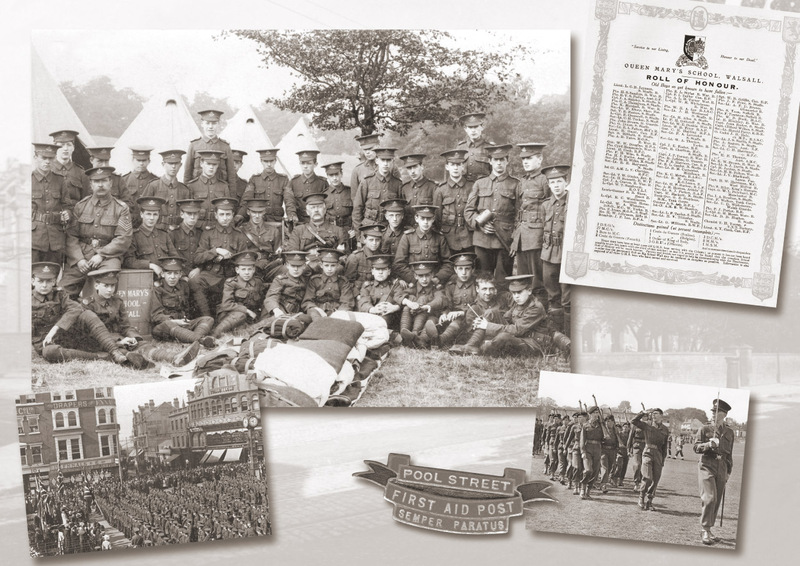 The Cadet Corps was formed on 17th May 1900 with around forty pupils enlisted. Initially the uniforms were a scarlet tunic with white-collar and cuffs, dark blue trousers with a red stripe, the cap was also dark blue with a South Staffordshire Regiment badge. By 1905 the scarlet and blue uniform had disappeared and was replaced by the familiar khaki dress. In 1944 the School registered a branch of the Air Training Corps (ATC). In 1948 the Junior Cadet Corps (JTC) as it was now known was abolished and replaced by the Combined Cadet Force (CCF) incorporating the JTC and ATC in one unit. The CCF contained three sections, Army, RAF and Basic. The Army and RAF Sections consisted of ex-JTC and ex-ATC members aged fifteen and over. The Basic Section combined ex-members from the JTC and ATC under fifteen years of age. This fine tradition formed a hundred and ten years ago is still very much an important part of the school today. At the bottom right of the page is a picture of Queens Mary’s CCF on Inspection Day at Mayfield Playing Fields, Sutton Road on the 20th May 1963. In the bottom left the picture shows the departure of the 5th Battalion of South Staffordshire Regiment from The Bridge on 11th August 1914. The badge shown is from the Second World War, reproduced in blue enamel on a brass background and reads “Pool Street First Aid Post, Semper Paratus”. Up until 1850 there were no public bathing facilities in Walsall and bathing in the canals and the water-filled old limestone pits was illegal. Thomas Gameson saw the potential in opening such a facility and he did so in premises on Dudley Street on a site opposite the present Bath Street, shown above. The baths were supplied with spring water and included a swimming and slipper baths plus a shower. An advertisement from 1851, with prices, for the baths is shown in the bottom right on the page above, along with fourpence for a second-class shower or swim. The prices do appear to be a little on the high side for those far off days and it wouldn’t be too much of an understatement to say only the more affluent citizens of the town patronised the establishment. Around 1860 another baths was opened in Littleton Street West by Elias Crapper. These remained in use until 1896 when the corporation opened the new premises in Tower Street which are shown in the main picture. Designed by Walsall architects Bailey & McConnal and built by Mr. R. Merton-Hughes of Birmingham, the new premises were opened in a blaze of glory by the Mayor, Councillor Noakes on Saturday 30th May 1896. The new baths, again structured on a first and second-class system, consisted of swimming and slipper baths along with a seemingly rather grand Turkish Bath, the first in Walsall. These premises served the town for over fifty-years before being demolished in 1959 to make way for the current Gala Baths which opened in 1961 on the same site. The smaller pictures on the page show the children’s lido at the Arboretum opened in 1953 and a lifesaving certificate from Walsall Swimming Club commemorating Blue Coat Schools achievements in life saving competitions in 1917. Finally, a pupil’s certificate for swimming fifty-yards in 1930, issued by Walsall Schools Swimming and Lifesaving Association. The main picture for this month was taken around 1910 and shows the Science and Art Institute and the small piece of parkland where the Cenotaph would stand a decade later. In 1887 the Mayor, William Kirkpatrick appealed for funds to erect a building to commemorate Queen Victoria’s Golden Jubilee. The completed building was opened on Monday 24th September 1888 by Sir Charles Forster Bart, MP, and the following Monday, 1st October, the first classes were taken in the new building. The smaller picture in the top right shows the Cenotaph in the early 1960s some forty years after its construction. It was built-in 1919 as a memorial to Walsall’s war dead from WWI. In the background of the picture can be seen the premises of J. Fenton the furniture store, G. Lentons confectioners and the Shoe Stores on the corner of Newport Street, just protruding above the roof line is the spire of St. Matthew’s Church. In the bottom left of the page is a picture of the remains of E. T. Holden Limited, the leather company, after its fire in 1908. In the main picture Holdens can be seen to the right of the Science and Art Institute. On the extreme left of the main picture the wall can be seen surrounding the railway goods yard on land which once was home to Walsall Races. Top left is a racecard from the meeting in 1852 along with one of the rarest pieces of Walsall memorabilia, a Race Subscription Ticket, of which there are only three now known to exist. 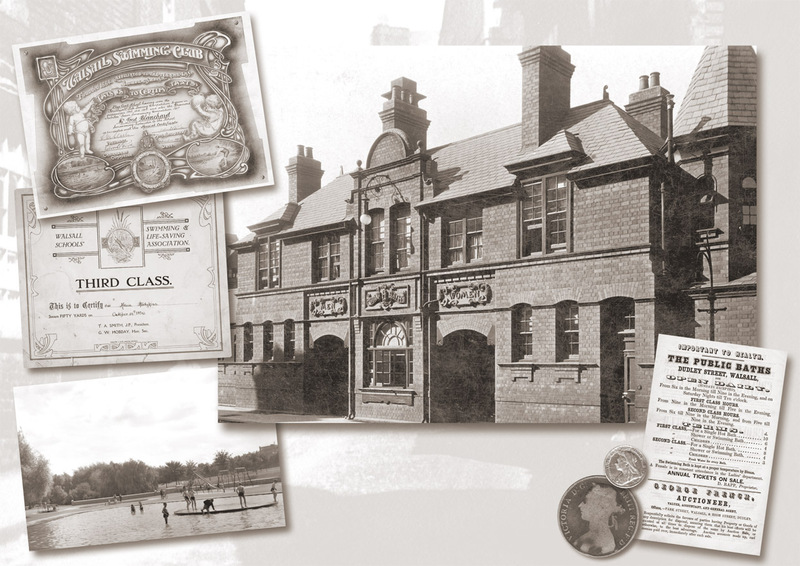 The monies accrued from subscriptions went to fund the building of the grandstand which was opened in 1809. The grandstand stood, coincidently, approximately where the Cenotaph is now situated. It was demolished in 1879. There can be few people in Walsall who didn’t have a friend or relative who worked at Crabtrees at sometime or another. The founder of the company, John Ashworth Crabtree, like many who made their mark on Walsall industry, was not born in the town but hailed from Lancashire. After the death of his father, his mother moved the family to Yardley, Birmingham. 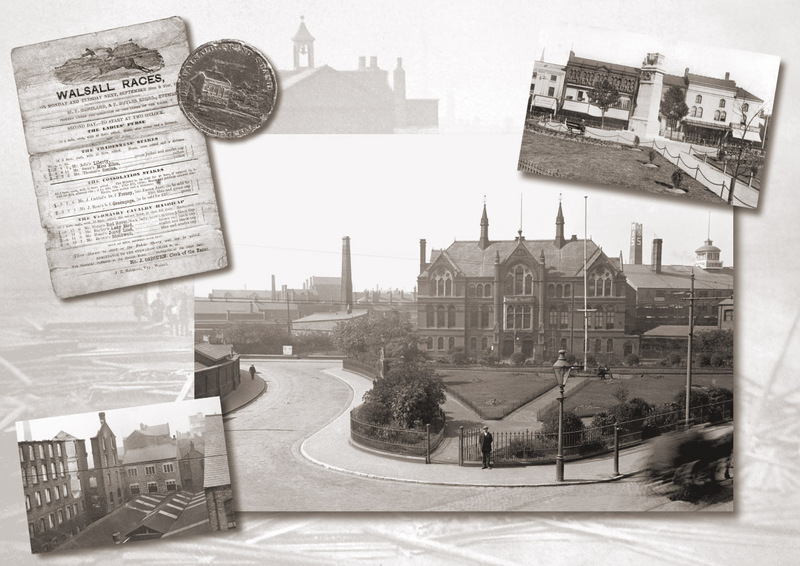 John’s first job was at Veritys Limited in 1902 later moving to J. H. Tucker & Co. Limited of Hay Mills, Birmingham. He began in the drawing office and progressed to Works Manager after ten years with the company. In 1918 John made the decision to set up in business on his own but not in Birmingham but Walsall. 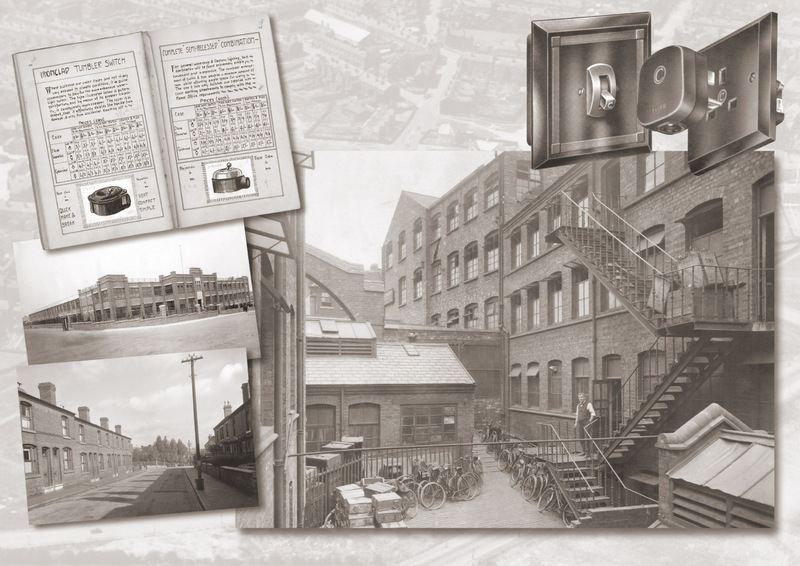 His first factory opened in 1919 in the old leatherworks previously occupied by another famous Walsall company, John Leckie & Co in Upper Rushall Street. Here he began the manufacture of electrical switches, plugs and sockets. The main picture above shows the rear of these premises which are still in use today as the Lyndon House Hotel. Due to the rapid expansion of the business, JAC as he was known, made a decision to move to a new purpose-built factory on the outskirts of the town in Chuckery. 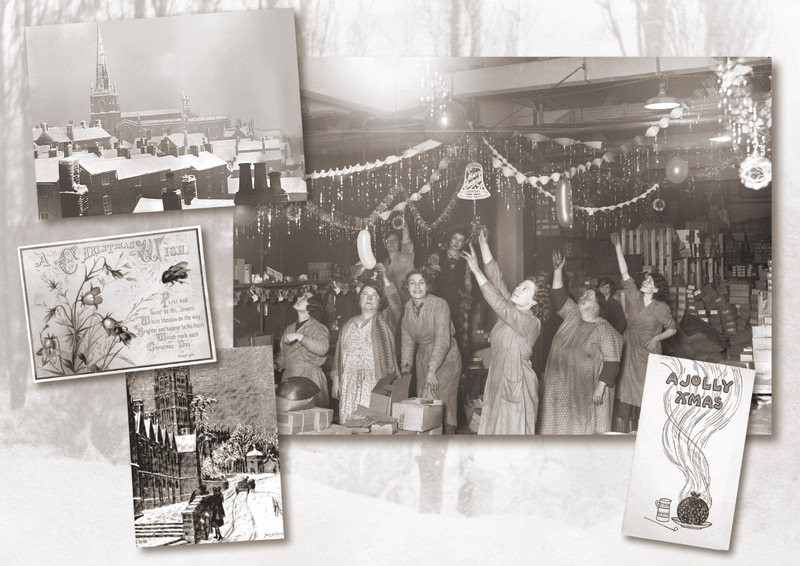 In 1926 Lincoln Works was opened and was situated on the corner of Beacon Street and Lincoln Road, previously known as Dark Lane. To the left of the main picture is a spread from the first catalogue for the company written and drawn by JAC himself. Below that is an early picture of the new factory in 1926 and a lovely study of Beacon Street….without cars…..or wheelie bins… just a dustbin!. The factory is hidden by the trees between the two rows of houses. After working in the new premises for just nine years John Crabtree died from pneumonia on 3rd December 1935 aged forty-nine. His son Jack took over and a new era began. After several takeovers the gates to Lincoln Works finally closed in 1996. The site of the factory is now a housing estate, but the Crabtree name lives on in the industry under the Electrium banner and is based in Cannock. There can be few Caldmore residents who, up until the 1970s, cannot remember the Happy Anniversary shop in Caldmore Road. 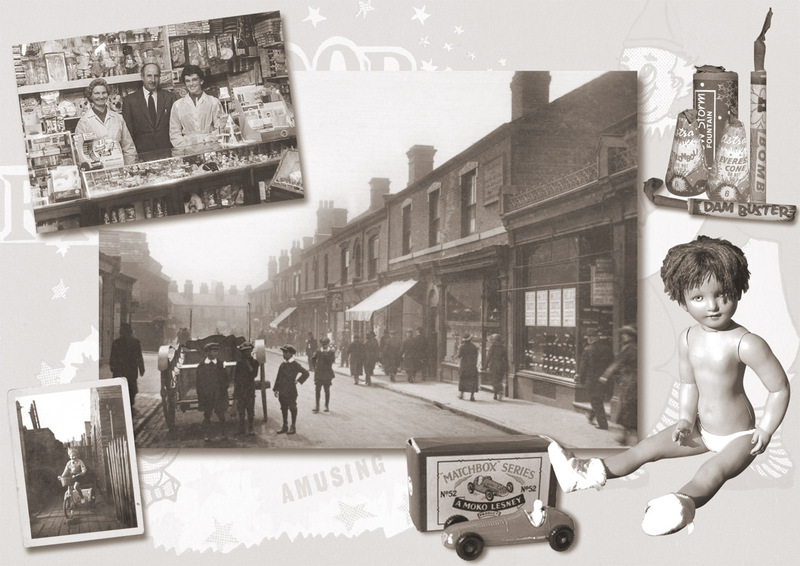 The picture top left shows the interior of the shop in the mid ‘60s complete with the proprietors Mr and Mrs Turner and assistant Nan Torkington. There was no need to go into “the town” for sweets, fireworks, Matchbox and Corgi toys, cap guns and holsters, cap bombs, tommy guns, cowboy and indian outfits …… even dolls …… and really boring things for our moms like birthday and Christmas cards.You name it the Happy Anniversary sold it! The main picture is of the right side of Caldmore Road looking towards Caldmore Green circa 1910. Just off-centre of the picture can be seen the large rectangular sign of the Singer Sewing Machine shop at number 49. The doll shown was called “Julie” by its owner and was bought from the Happy Anniversary as a welcome home present in 1957 by the parents of a little girl who had been hospitalised in isolation due to contracting polio. Years later a younger relative of the little girl decided “Julie” should have a new hairstyle hence the appearance of a well-worn mop sitting on her head! Another item purchased from Mr and Mrs Turner was the red indian headress worn by the lad in the picture on the three-wheeler. It’s interesting to note the dress of kids playing in the 1950s ……… an indian headress plus collar, tie and a beige pullover. Sitting Bull never looked so good! As the nights drew in and clocks changed thoughts of Bonfire Night crept into young lads minds and sure enough Mr and Mrs Turner wouldn’t let you down with their well stocked cabinets full of the best fireworks available from a penny …….. and upwards. A small collection worth about a “bob” are shown top right. The main picture above was used in the first calendar produced in 2002, at that time the name of the company where the photograph had been taken wasn’t known. In early 2003 a lady contacted me to tell me the company was William Bate Limited of Hospital Street, she knew this to be true as the lady who is smiling and looking directly at the camera was her sister-in-law! With Christmas time approaching the women added to their already busy workload by putting up decorations to give a more festive feel to their working environment. William Bate Limited was established in 1883 and specialised in electro-plating, which, looking at the colour of the women’s hands, was pretty dirty work. The other picture in the top left first appeared in the calendar for 2003 but is such an unusual and atmospheric image the decision was made to include it again. The picture was taken around 1920 from a location believed to be in Birmingham Street looking across the snow-covered roofs of Gorton’s Yard and Hill Street to St. Matthew’s Church. It is purely a personal opinion, but I think this is one of the great images of a Walsall long gone and I am indebted to Spencer Evans of The Curio Shop in George Street for allowing me to use it again. The three Christmas cards displayed are from different eras. The card with a look of springtime about it was sent to a Walsall family around 1895 and the smaller card in the bottom right was sent by Mr and Mrs Lees of Camden Street to friends at Christmas in 1908. Finally, a personal card from John and Gwendolen Crabtree sent during the 1930s. John as well a being a very successful businessman, economist and engineer was also a talented artist and cartoonist and for many years illustrated his own Christmas cards and many other publications. Tagged: Arboretum skating, Crabtrees, Hatherton Street, Hawbush Road, John Crabtree, John Curry, QMS Army Cadets, St. George's Church, Tame Street East, The Pheasant pub, Walsall, Walsall baths, Walsall market, William Bate Ltd.
You are currently reading Walsall Lives 2011 at Walsall Life.